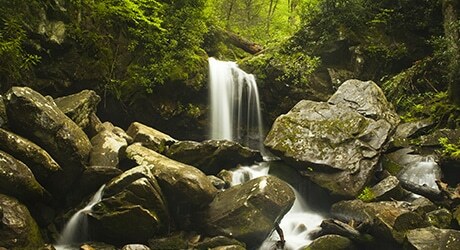 Start your day on a high note as you take a moderate 2.6-mile roundtrip hike to see Grotto Falls in The Great Smoky Mountains. This hike is ideal on a hot sunny day, as the shade from the trees is perfect for keeping you cool. Bring your camera and grab a snapshot behind the falls, as there is a small walking trail behind it, giving you a light spritz of the refreshing mountain springs. Hiking Grotto Falls: During your hike of Grotto Falls trail you will follow the Trillium Gap trail as it cuts through a forest filled with large hemlock trees. During the month of May, you will also see an array of wildflowers ranging from white and yellow trillium, to white violets and stitchwort. The full hike of Grotto Falls trail will be a moderate climb through a wide worn out path that will put you in a peaceful state of mind as you cross four small streams. 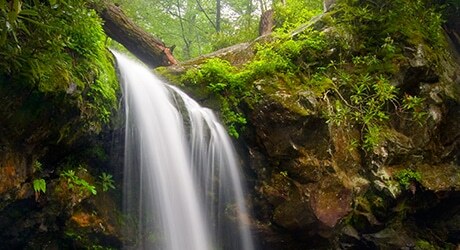 After about a mile into the trail, hikers will come across a tumbling cascade where by looking upstream Grotto Falls will come into view in the distance. This waterfall is unique, as it’s the only fall in the Great Smoky Mountains National Park that has a walking path directly behind it. This provides a unique experience and allows for a cool and misty break area for summer hikers. It also makes for a nice spot to look for salamanders. Two miles away from the falls is the Brushy Mountain summit and 5.6 miles from the waterfall is the trail to reach the Mt. LeConte summit. Both summits will offer some of the most rewarding views of the area. Remember it is important to drink plenty of water for any hike into the mountains. Portions of the trail can get very rocky and uneven so sturdy hiking shoes are also recommended. Pets and bicycles are prohibited on the trail. Starting from Light #8 in Gatlinburg, turn onto Historic Nature Trail/Airport Road. From there you will veer right onto Cherokee Orchard Road. After driving 2.2 miles you will arrive at the one-way Cherokee Orchard Loop. You will drive for about a mile on the loop before turning right onto the Roaring Fork Nature Trail. Parking for the Grotto Falls Trail will be on the left side of the road after 1.6 miles on the loop. The trailhead can be found on the opposite side of the road.